Staff Sergeant Robert M. Martin, WW II. In March of 2013, Peter den Tek was hunting for ancient Roman artifacts in a field near Asperen, Holland, when he unearthed two relatively modern .50 caliber shell casings from World War II. The casings were American, and den Tek, an avid historian, knew they were out of place, for although German troops had occupied the area during the war, no known land battles had occurred in that vicinity. He therefore surmised they might be relics of an aerial battle, and subsequent research led him to learn that a desperate duel of life and death had in fact occurred decades ago and thousands of feet above that field. Further investigation revealed a connection to a place den Tek had never heard of – Smithfield, Rhode Island. “Hi Coach, It’s been a long time since I’ve written you and a lot has happened since then.” Thus began a letter written by Robert M. Martin of Spragueville to his former high school football coach Tom Eccleston Jr. in December of 1942. World War II was raging, and Martin was serving in the United States Army Air Corps training to be an aerial gunner. In Martin’s case, being “flunked” would have relegated him to a ground assignment; a horrible disappointment for a man who yearned to fly. Those who served in the Air Corps were volunteers, but applicants were expected to be “perfect” both physically and scholastically with no margin for error. In another letter dated February 3, 1943. Martin wrote that he completed gunnery school and was promoted to Staff Sergeant. He was assigned to the crew of a B-17, a four-engine “heavy bomber” designed to deliver its payload of explosives to the heart of the Third Reich. Such a plane was ideally suited to a man of Martin’s training for it bristled with up to twelve machine-guns, earning it the name, “Flying Fortress”. 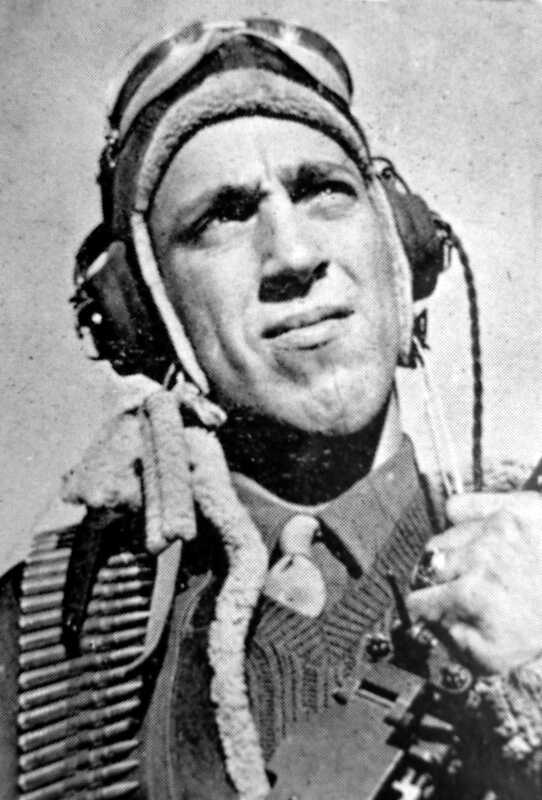 Martin was designated the ship’s “tail-gunner”. Martin wrote he was offered the chance to go to Officer’s Candidate School, but turned it down. “I just as soon stay in the ranks,” he wrote Eccleston, “I’m making so much money right now if not more taking everything into consideration, than a second lieutenant does.” In addition to his regular pay, he was receiving “flight-pay”, and would get a twenty percent increase once overseas. Martin further wrote that he hoped to see Eccleston sometime in June for he expected a brief leave to see friends and family before going overseas. “It’s been a long time and the old pace sure will look good to me.” Whether the army granted that promised leave is uncertain, as things can change quickly during wartime. Martin’s crew was assigned to the 8th Air Force, 92nd Bombardment Group, 407th Squadron, and sent to England where they would take part in the allied strategic bombing campaign being waged against Europe. On July 28, 1943, Martin woke before dawn, shaved, ate breakfast, and made his way to briefing for what would be his crew’s first combat mission. It’s possible the men joked back and forth to hide their apprehension of what the day would hold. The target that day was a ball-bearing plant in Kassell, Germany. After dropping their bombs the formation turned for home, but along the way encountered heavy flack and enemy fighter planes. Martin’s plane suffered damage causing it to fall behind from the protection of the formation. Then they were on their own; a “straggler”. Sensing blood, a squadron of five German fighters moved in for the kill. The parachute that “disappeared quickly” was evidently Sgt. Martin’s, whose body was later identified by his crewmate, Tec. Sgt. Stephen Maksin, who noted that Martin’s chute was badly torn. Martin’s remains were brought to a nearby village and buried, but after the war they were re-interred in Ardennes American Cemetery, Belgium. The rest of Martin’s crew survived, and spent the remainder of the war as POWs. Of the five German fighters that attacked Martin’s aircraft, two were shot down. Although it can never be proven, perhaps S/Sgt. Martin was responsible for downing one of them. It’s also possible the shell casings found by Peter den Tek might have come from Martin’s gun – at least it’s an intriguing thought to consider. After learning the details of that long forgotten air battle, den Tek began planning the creation of a memorial to honor Martin and his crew. His idea has generated tremendous local interest and he is currently negotiating with Dutch officials over a suitable location for the project. Through old photographs and eye witness accounts, den Tek has located the B-17’s crash site and has recovered pieces of the aircraft. He believes at least one engine still lies buried in a field, and if it can be recovered, he wants to incorporate it into the memorial. If soil conditions are right, it could still be in relatively good condition. He has also learned that one of the plane’s machine guns is on display in a museum, and hopes the serial number will give him a clue as to its position on the B-17. The research that Peter den Tek has conducted since his initial discovery has been, to use a metaphor, like peeling an onion, for the air battle that brought down Martin’s B-17 is only a fragment of the overall story. There is so much more to tell. For example, there were nine other crewmen on S/Sgt Martin’s aircraft, and his was but one of many lost that day. Furthermore, Dutch civilians, some from the Asperen area, were used as forced labor by the Nazi’s in the very industrial complex the allies bombed! There is other information that Peter has shared, but for now it will have to wait, for this story is still unfolding. (A follow-up article is anticipated.) In the meantime, he and I correspond through frequent e-mails as he literally digs deeper to preserve the memory of a crew of World War II airmen.